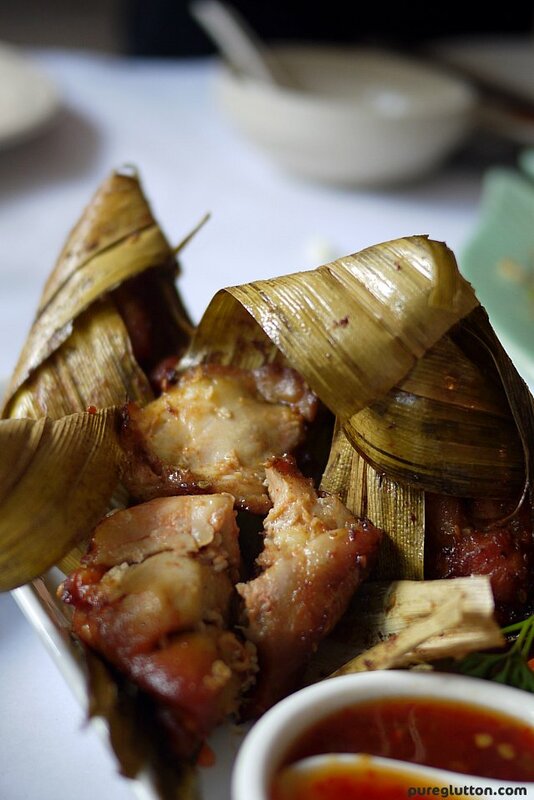 Rama V’s Weekend Lunch a la carte Buffet – such decadence! The few times I have eaten at Rama V had always been at dinner time and thus, I had always been treated to the beautiful and romantic ambience that dusk and night brings to the place. Warm amber lamps would light up the garden and lotus pond, casting flickering shadows among the foliage and golden shimmers on the water – all these give Rama V a magical mysterious air after sunset. Recently I had a chance to step into Rama V in broad daylight. 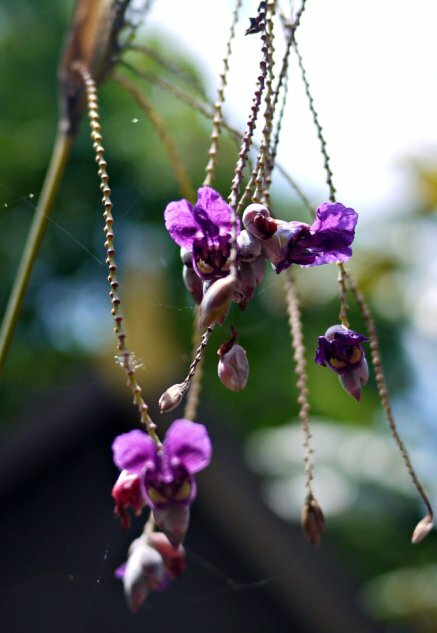 It was a hot and sultry Sunday afternoon, with the sun at its brightest and the whole Rama V courtyard and garden were cast out in their stunning beauty. Every leaf, flower, stone and pebble was outlined in stark clarity … how can one not be charmed by the colorful splendour in every nook and corner? Despite the scorching heat from the unrelenting sun, there was a gentle breeze … small purple flowers were bobbing and swaying … and lying serenely at the feet of a stone statue, a lone tortoise was sunbathing lazily, quite unperturbed by the clicking of my camera. I swear it glared at me disdainfully before slipping back surreptitiously into the cool green water. This is a perfect idyllic setting for a lazy afternoon, I told myself… how about a leisurely lunch, preferably with some wine and great company, endless laughter and chatter… and that was exactly what I had that day! We had the pleasure of checking out Rama V’s Weekend a la carte Buffet Lunch. At RM68.90++ per person, this is really good value for your money, I would say…because free-flow of wine and beer is also included. To prevent wastage and to ensure you get freshly-cooked dishes for every order, the good people at Rama V has devised a system for ordering. Say, for a group of 1-5 people, you get to order 8 items from a special menu selection ranging from appetizers to desserts. Once you have finished these, proceed to place the next order and the next… there is no limit to the number of orders you can place, provided you finish up everything you order! Now, isn’t that a great system? I mean, for a pleasant dining experience and in order not to jam up the kitchen, to ensure every guest gets piping hot food from the kitchen, and certainly to prevent wastage (that’s a sin! ), I think this is excellent. Kudos to the owners: Andre Shum and Danny Jee … these guys think of everything! From the Appetizers, we had the Mieng Kam, the Pik Kai Tod and of course, their iconic Chor Ladda. 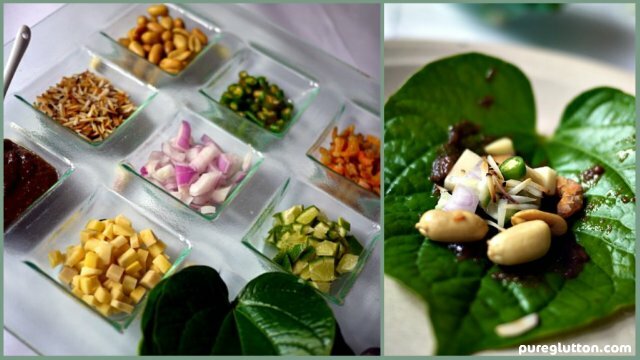 The fold-it-yourself Mieng Kam with the various chopped ingredients…shallots, ginger, keylime, fried coconut, dried shrimps, peanuts, chilli padi and a piquant sauce all folded inside a “daun kadok” and get ready for a burst of flavours in your mouth! 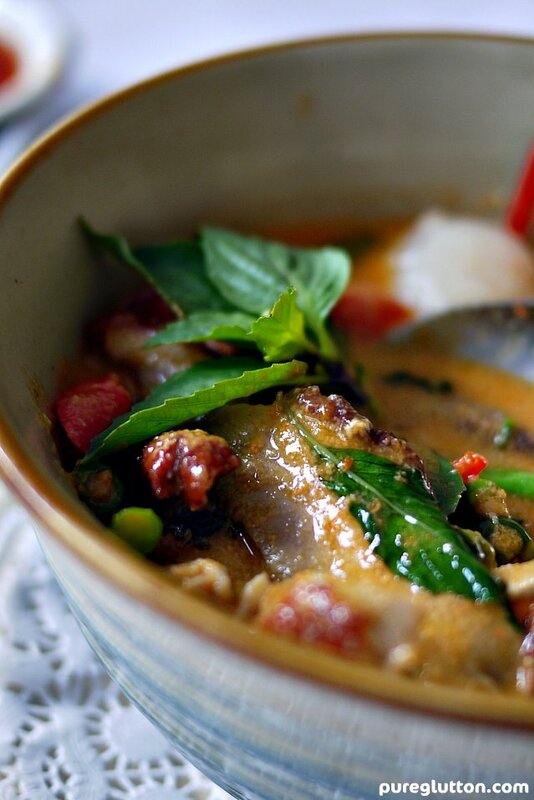 The sweet, sour, spicy and savoury flavours you get are the epitome of Thai cuisine and I think the Mieng Kam represents this so well. The Chor Ladda must surely be the icon of Rama V… and Andre Shum, co-owner, nodded his head in total agreement. 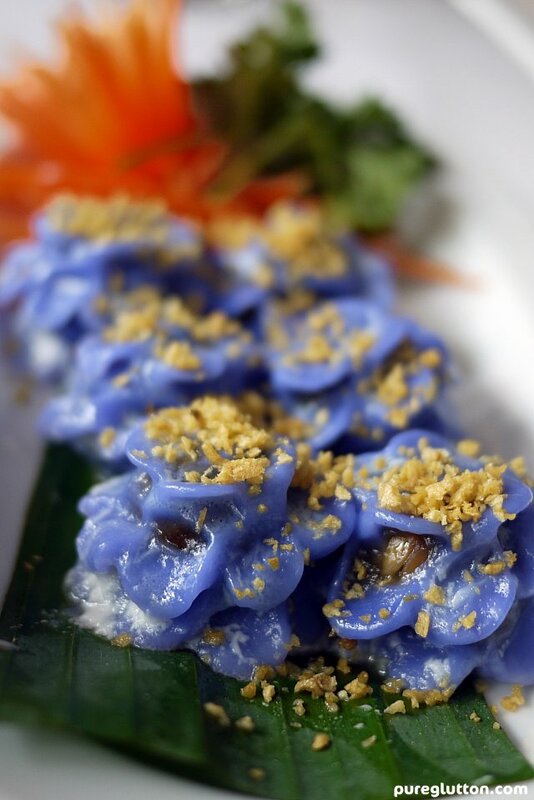 The pretty blue flower-shaped dumplings is a must-order on almost every table… and we had like, 3 plates of these at our table! 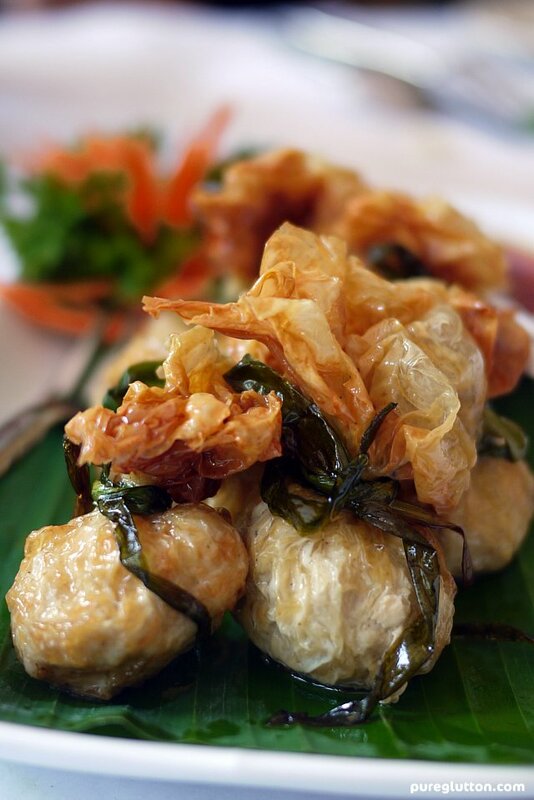 I must bestow another title to the Chor Ladda – it is singularly the Most Photogenic item on Rama V’s menu! As I was the first to arrive for that lunch, I placed an order for their Pik Kai Tod – and it turned out to be the most popular dish at our table that afternoon. I lost count of the no. of plates of these that were served… it’s like never-ending, plate after plate was placed on our table and every plate was wiped clean! Need I say more about how delicious these are? 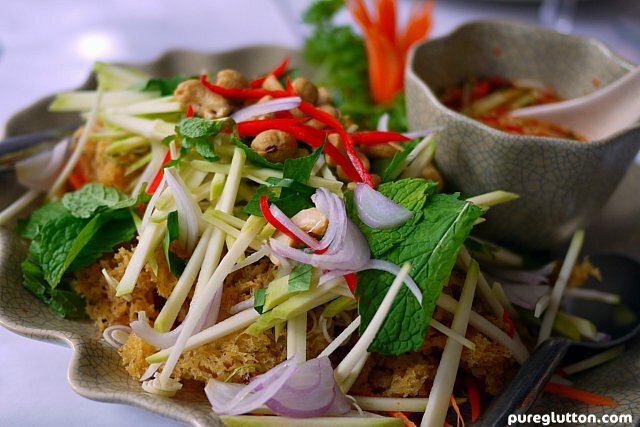 From the Salads, I chose the Spicy Crispy Catfish Salad and again, this turned out to be outrageously popular among my fellow lunchers. Flakes of catfish are mixed with a light batter and fried to crunchy bits… toss these with some shredded young mangoes, onions, sliced lemongrass, chillies, cashew nuts and drizzle some lime juice and Thai fish sauce over and you have a lip-smacking winning combination. I picked the Yam Pra In on a whim and also because I have never tried anything like it before. 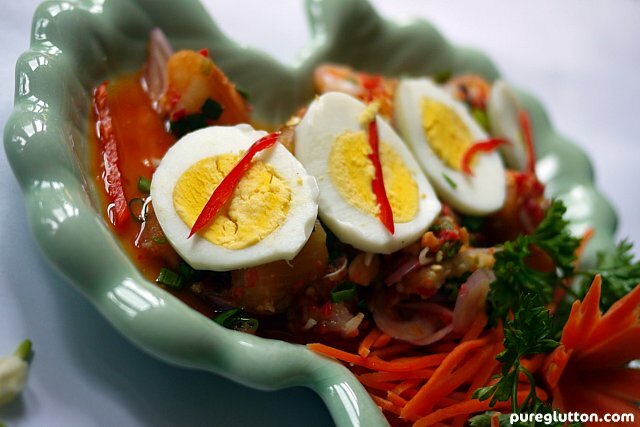 Eggplants are one of my favourite vegetables and in this dish, the chunks of eggplants have totally absorbed the tangy Thai dressing and together with the shrimps, it was a delightful play of textures and tastes. This is something you ought to try if you want to try a Thai salad that’s a bit different from the usual mangoes and young papayas. I love the soups in Rama V… they are flavoured very delicately but tantalisingly aromatic, thanks to the lemongrass, galanggal and kaffir lime leaves. 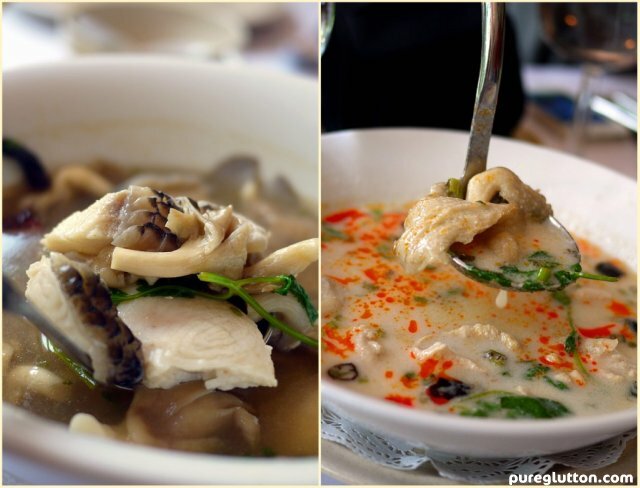 The King Fish Soup is my favourite – the thick slices of fish were fresh, tender and sweet and the averagely spicy soup had none of the killer fieriness that I dread. It’s not that I can’t take fiery stuff but too much of that just kills off my palate and I taste nothing but the fire on my tongue. For the Mains, we were spoilt for choice as there were so many dishes to choose from Curries, Beef, Poultry, Seafood, Vegetables, Noodles and Rice. 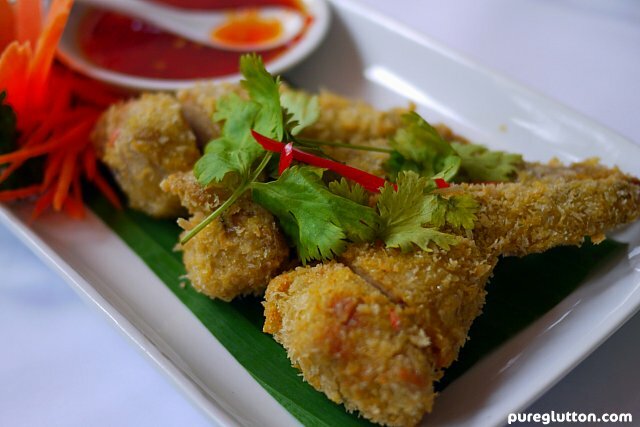 The Fried Chicken in Pandan Leaves will never go wrong… juicy boneless chicken well marinated in mild spices… kids will love this. 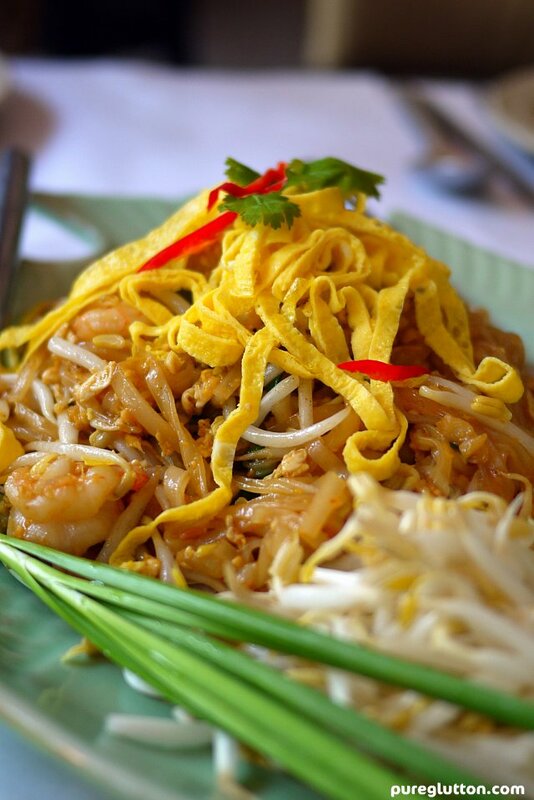 The Pad Thai at Rama V is definitely one carbs item you have to order. It’s done very nicely here… smooth silken rice noodles tossed with just the right amount of heat, not oily, mildly spicy and the raw beansprouts and chives balance the textures well. I think we had 4 plates of those, hehe! The Roast Duck Red Curry with Lychees is a signature dish and it’s so good I kept spooning the curry onto my plate even after the roast duck slices and lychees have long gone. 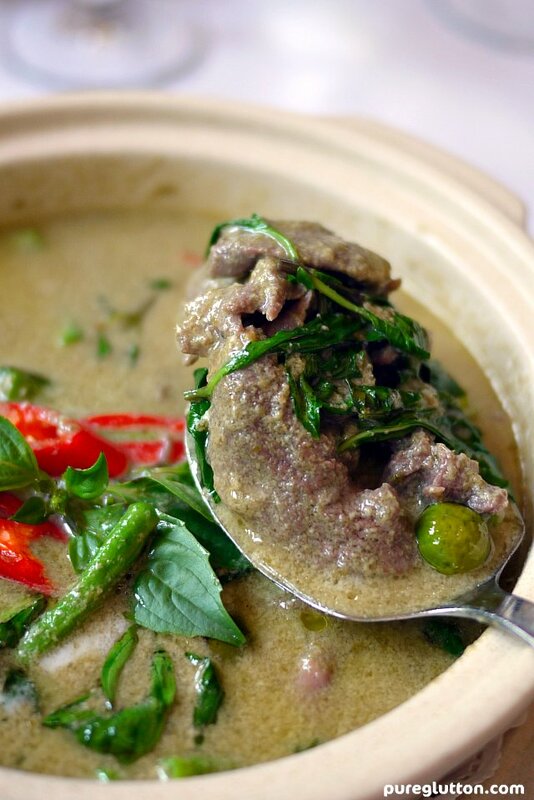 The thick curry is fragrant with coconut milk mixed with the myriad of Thai spices and further infused with the smoky flavours of the roast duck – what’s there not to like?! 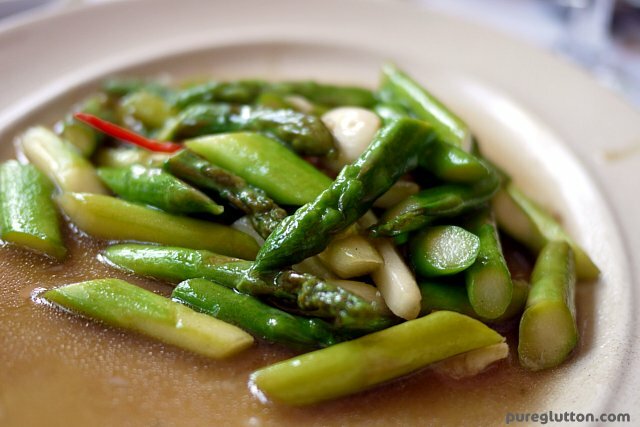 The thing about the food in Rama V is that their chefs are careful with the balance of flavours, sticking very much to the traditional recipes. So, if you are looking for fusion or new-age kinda funky dishes here, this is not the place. Generally the food is not overly spicy or fiery-hot… but if you prefer to sweat your palate out, you can always request them to add on the chillies. 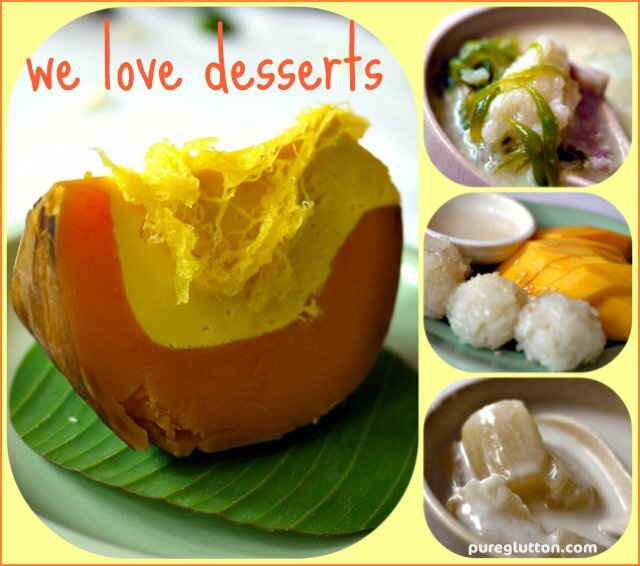 The Desserts section features mostly traditional sweets like Pumpkin Custard, Steamed Tapioca in Coconut Milk (my favourite), Waterchestnut rubies with jackfruit in coconut milk, Mango with Sticky Rice and Candied Bananas in Coconut Milk. I also enjoyed their Chendol, Taro & Sticky Rice in Coconut Milk … kinda like the Bubur Cha Cha but replacing sweet potatoes with the sticky rice blobs. Ahhh… we slurped every drop off the bowl. 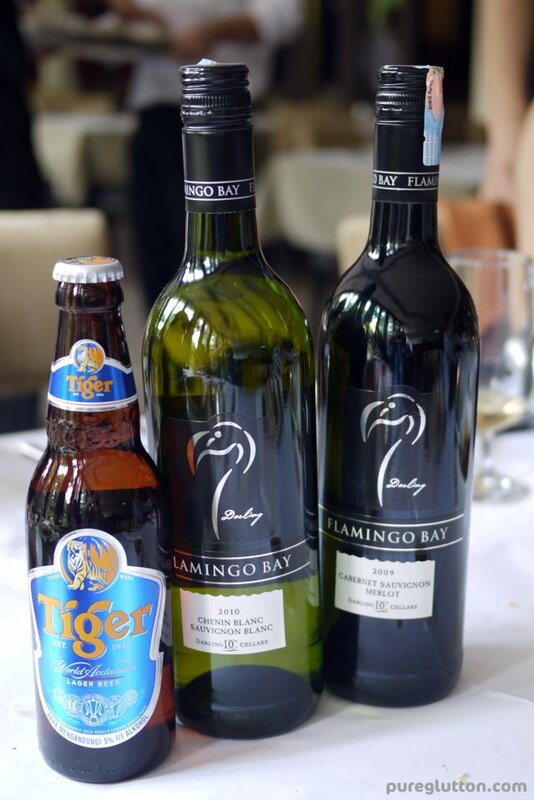 Free-flow of Red and White Wine and endless bottles of Tiger Beer are included! After lunch, we were given a tour of their latest addition upstairs – a multi-purpose function room that’s so new you can still smell the lacquer on the wood! Furbished with lots of dark wood, plush drapes, Thai paintings and decoratives, this is ideal for your meetings or private parties. The room seats 50 people comfortably for dining and 70 people theatre-style for meetings/workshops/ presentations etc. A state-of-the-art karaoke system will be installed soon… karaoke-kakis, take note! 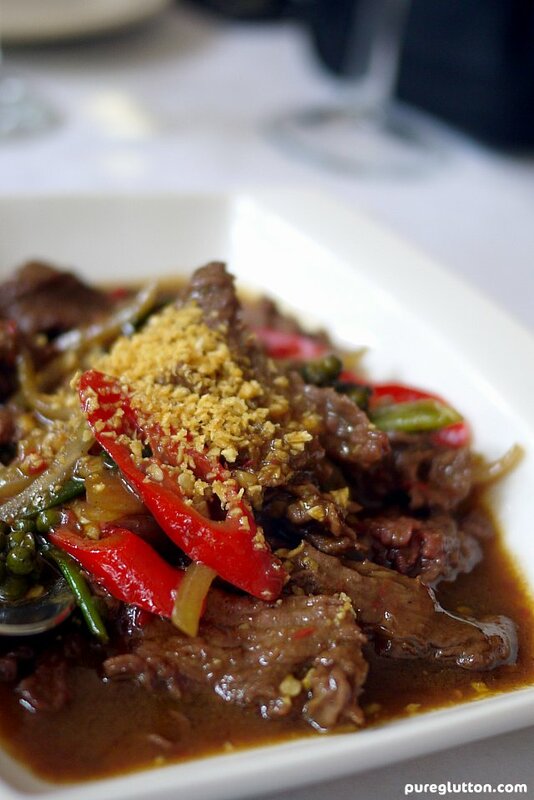 This Weekend Lunch is Rama V’s way of letting their customers taste a wider variety of their dishes at a leisurely pace at an affordable price, and over free-flow of red & white wines and beer too! This is available from 12.00pm-3.00pm on Saturdays & Sundays, with last order of food at 2.30pm and last order of wines/beer at 2.45pm. Do call ahead to reserve your tables as they are packing in quite a crowd for this super-value promotion! Great… i’m sure you’ll have a swell time there! 🙂 I wanna go back again too! Yes, really worthwhile! I’ve been back there again already! 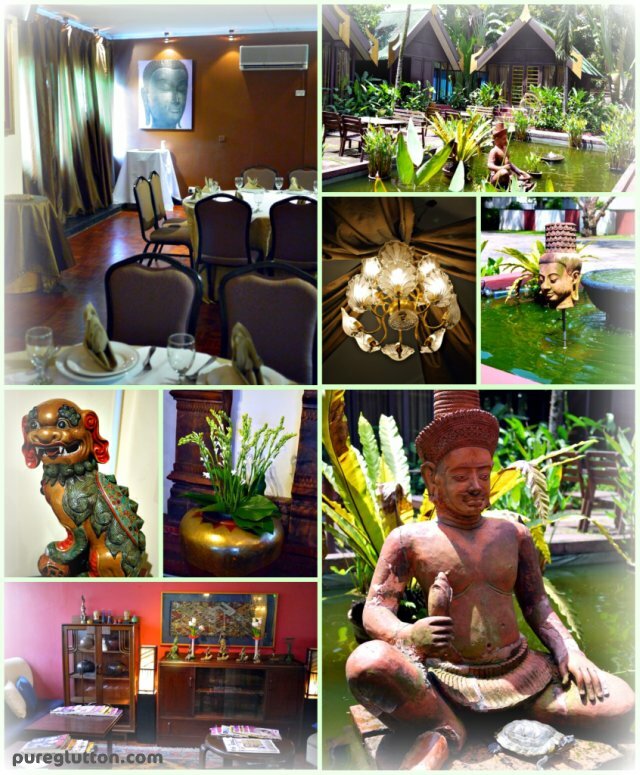 Believe it or not I never been to Rama V. The pictures sure look amazing!